. - WD AV-25 WD1600BUCT 160GB 5400RPM 2.5 16MB Cache HDD NEW SEALED! Fujitsu - MHW2160BH FUJITSU - 160GB 5400RPM 8MB BUFFER SATA 2.5inch NOTEBOOK HARD DRIVE (MHW2160BH). IN STOCK. SHIP SAME DAY. Fujitsu - MHZ2160BH FUJITSU - 160GB 5400RPM 8MB BUFFER SATA-II 7-PIN 2.5INCH(LOW PROFILE) NOTEBOOK DRIVE (MHZ2160BH). IN STOCK. SHIP SAME DAY. Toshiba - HDD2H25 TOSHIBA - 160GB 5400RPM 8MB BUFFER SATA-II 7-PIN 2.5INCH MOBILE HARD DISK DRIVE (HDD2H25). IN STOCK SHIP SAME DAY. Toshiba - MK1646GSX TOSHIBA - 160GB 5400RPM 8MB BUFFER SATA-II 7-PIN 2.5INCH(LOW PROFILE) NOTEBOOK DRIVE (MK1646GSX). IN STOCK. SHIP SAME DAY. Seagate - ST9160827AS SEAGATE - MOMENTUS 160GB 5400RPM SERIAL ATA-300 (SATA-II) NCQ 2.5INCH FORM FACTOR 8MB BUFFER INTERNAL HARD DISK DRIVE (ST9160827AS). IN STOCK. SHIP SAME DAY. Seagate - ST9160823AS SEAGATE - MOMENTUS 160GB 7200RPM SERIAL ATA-300 (SATA-II) 2.5INCH FORM FACTOR 8MB BUFFER INTERNAL HARD DISK DRIVE FOR NOTEBOOK WITH G FORCE PROTECTION (ST9160823AS). IN STOCK. SHIP SAME DAY. Toshiba - HDD2D92 TOSHIBA - 160GB 5400RPM 8MB BUFFER SATA-II 7-PIN 2.5INCH(LOW PROFILE) NOTEBOOK DRIVE(HDD2D92). IN STOCK. SHIP SAME DAY. 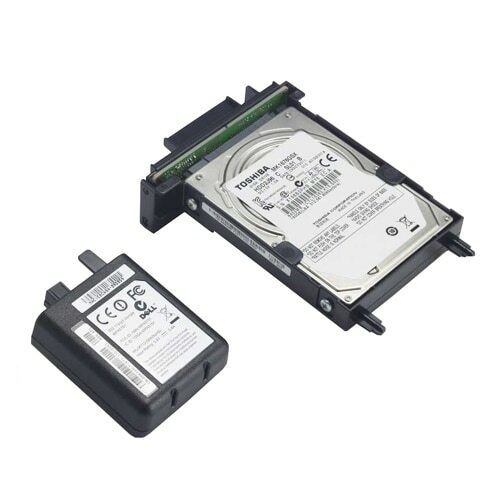 Toshiba - MK1655GSX TOSHIBA - 160GB 5400RPM 8MB BUFFER SATA-II 7-PIN 2.5INCH MOBILE HARD DISK DRIVE (MK1655GSX). IN STOCK. SHIP SAME DAY. Toshiba - HDD2D60 TOSHIBA - 160GB 5400RPM 8MB BUFFER SATA-II 7-PIN 2.5INCH NOTEBOOK HARD DISK DRIVE(HDD2D60). IN STOCK SHIP SAME DAY. Toshiba - MK1637GSX TOSHIBA - 160GB 5400RPM 8MB BUFFER SATA-II 7-PIN 2.5INCH NOTEBOOK HARD DISK DRIVE (MK1637GSX). IN STOCK. SHIP SAME DAY. Seagate - ST9160310AS SEAGATE - MOMENTUS 160GB 5400RPM SERIAL ATA-300 (SATA-II) 2.5INCH FORM FACTOR 8MB BUFFER INTERNAL HARD DISK DRIVE FOR NOTEBOOK (ST9160310AS). IN STOCK. SHIP SAME DAY. Fujitsu - MHV2160BT FUJITSU - 160GB 4200RPM 8MB BUFFER 2.5INCH SATA NOTEBOOK HARD DRIVE (MHV2160BT). IN STOCK. SHIP SAME DAY. 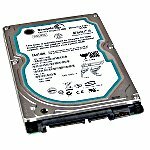 Hitachi - 0A52124 HITACHI - TRAVELSTAR 160GB 5400RPM 8MB BUFFER SATA 2.5inch NOTEBOOK HARD DISK DRIVE(0A52124). IN STOCK. SHIP SAME DAY. Hitachi - HTS541616J9SA00 HITACHI - TRAVELSTAR 160GB 5400 RPM SATA 2.5IN 9.5MM NOTEBOOK HARD DISK DRIVE (HTS541616J9SA00). IN STOCK. SHIP SAME DAY. Hitachi - 0A56413 HITACHI - TRAVELSTAR 160GB 5400RPM 8MB BUFFER SATA-II 3.5INCH NOTEBOOK DRIVE (0A56413). IN STOCK. SHIP SAME DAY. Hitachi - MK1652GSX TOSHIBA - 160GB 5400RPM 8MB BUFFER SATA-II 7-PIN 2.5INCH MOBILE HARD DISK DRIVE (MK1652GSX). IN STOCK. SHIP SAME DAY. 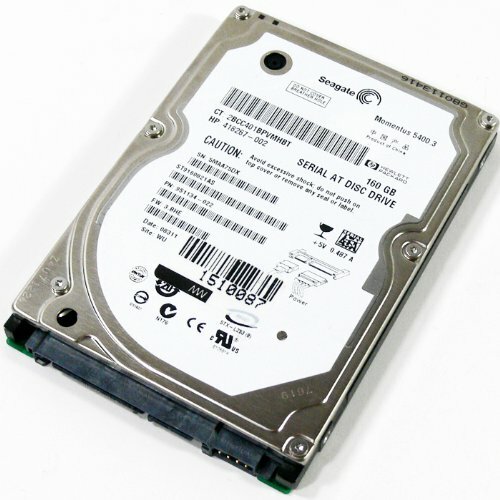 Hitachi - HTS542516K9SA00 HITACHI - TRAVELSTAR 160GB 5400RPM 8MB BUFFER SATA 7-PIN 2.5INCH NOTEBOOK HARD DISK DRIVE (HTS542516K9SA00). IN STOCK. SHIP SAME DAY. Hitachi - HTS541616J9AT00 HITACHI - TRAVELSTAR 160GB 5400RPM ATA-7 8MB BUFFER 2.5INCH NOTEBOOK DRIVE(HTS541616J9AT00). IN STOCK. SHIP SAME DAY. Hitachi - 0A28844 HITACHI - TRAVELSTAR 160GB 5400RPM SATA 2.5IN 9.5MM NOTEBOOK HARD DISK DRIVE (0A28844). IN STOCK. SHIP SAME DAY. Toshiba - HDD2H03 TOSHIBA - 160GB 5400RPM 8MB BUFFER SATA-II 7-PIN 2.5inch MOBILE HARD DISK DRIVE (HDD2H03). IN STOCK. SHIP SAME DAY. 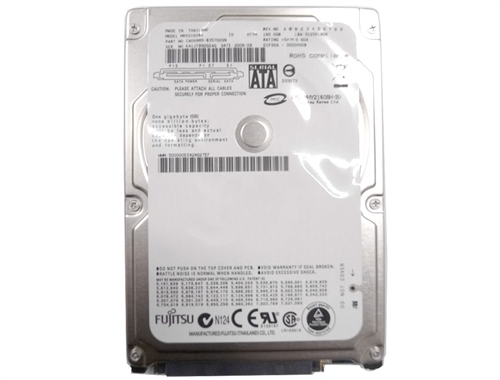 Fujitsu - MJA2160BH FUJITSU - 160GB 5400RPM 8MB BUFFER SATA-II 7-PIN 2.5INCH (ROHS) HARD DISK DRIVE (MJA2160BH-G2). IN STOCK. SHIP SAME DAY. SEAGATE - HARD DRIVE - ST9160823ASG SEAGATE - MOMENTUS 160GB 7200 RPM SATA-II 8MB BUFFER 2.5 INCH LOW PROFILE HARD DISK DRIVE (ST9160823ASG). IN STOCK. SHIP SAME DAY. Hitachi - 0A28419 HITACHI - TRAVELSTAR 160GB 5400RPM ATA-7 8MB BUFFER 2.5INCH NOTEBOOK DRIVE(0A28419). IN STOCK. SAME DAY SHIPPING. Samsung - HM160HI SAMSUNG - SPINPOINT M5 160GB 5400RPM 8MB BUFFER 2.5INCH SATA LAPTOP HARD DISK DRIVE. (HM160HI.IN STOCK. SHIP SAME DAY. Fujitsu - MHY2160BH FUJITSU - 160GB 5400RPM 8MB BUFFER 2.5INCH SATA NOTEBOOK HARD DRIVE (MHY2160BH). IN STOCK. SHIP SAME DAY. Baby Gund - HM160JI SAMSUNG - 160GB 5400RPM 8MB BUFFER 9.5MM SATA 2.5INCH LAPTOP HARD DISK DRIVE.(HM160JI). IN STOCK. SHIP SAME DAY. Hitachi - HTS722016K9SA00 HTS722016K9SA00 Hitachi Travelstar 160GB 7.2K RPM 16MB Buffer 2.5inches Form Factor SATA150 Notebook Hard Drive. New Bulk Pack. Hitachi - HTS541616J9SA00 HTS541616J9SA00 Hitachi TravelStar 160GB 5.4K RPM 8MB Buffer 2.5Inches Form Factor SATA150 Notebook Hard Drive. New Bulk Pack. 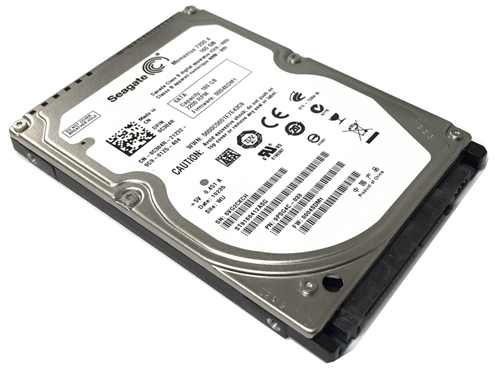 Seagate - ST9160821AS ST9160821AS Seagate Momentus 160GB 5.4K RPM 8MB Buffer 2.5Inches Form Factor SATA150 Notebook Hard Drive. New Bulk Pack. Fujitsu - MJA2160BH MJA2160BH Fujitsu 160GB 5.4K RPM 8MB Buffer 2.5Inches Form Factor SATA Mobile Hard Drive. New Bulk Pack. Hitachi - HTS545016B9A300 HITACHI - TRAVELSTAR 5K500.B 160GB 5400RPM 8MB BUFFER SATA-II 7-PIN 2.5INCH NOTEBOOK HARD DISK DRIVE (HTS545016B9A300). IN STOCK. SHIP SAME DAY. Seagate - ST9160821AS SEAGATE - MOMENTUS 160GB 5400 RPM SERIAL ATA-150 (SATA) NOTEBOOK HARD DISK DRIVE. 8MB BUFFER 2.5 INCH (ST9160821AS). IN STOCK. SHIP SAME DAY. Toshiba - MK1652GSX MK1652GSX Toshiba 160GB 5.4K RPM 8MB Buffer SATA-II 7Pin 2.5Inches Mobile Hard Disk Drive. New Bulk Pack. Western Digital - WD1600BEKT WD1600BEKT Western Digital Scorpio 160GB 7.2K RPM 16MB Buffer 2.5Inches Form Factor SATA 300 Mobile Hard Drive. New Bulk Pack. Hewlett Packard - 575053-001 575053-001 HP 160GB 7.2K RPM 2.5inches Form Factor SATA 3G Hard Disk Krive. New Bulk Pack. Hitachi - 0A57911 HITACHI - TRAVELSTAR 5K500.B 160GB 5400RPM 8MB BUFFER SATA-II 7-PIN 2.5INCH NOTEBOOK HARD DISK DRIVE (0A57911). IN STOCK. SHIP SAME DAY. Samsung - HM160HC SAMSUNG - SPINPOINT M5 160GB 5400RPM 8MB BUFFER ATA-100 2.5INCH PATA NOTEBOOK DRIVE (HM160HC).IN STOCK. SHIP SAME DAY. Western Digital - WD1600BEVT WESTERN DIGITAL - SCORPIO BLUE 160GB 5400RPM SATA-II 7PIN 2.5INCH 8MB BUFFER NOTEBOOK DRIVE. WD1600BEVT IN STOCK. SHIP SAME DAY. Hitachi - 0A59573 0A59573 Hitachi Travelstar 160GB 7.2K RPM 16MB Buffer 2.5inches Form Factor SATA300 Notebook Hard Drive. New Bulk Pack. 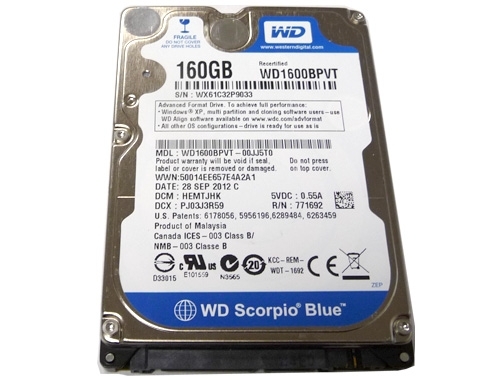 Western Digital - WD1600BUDT WESTERN DIGITAL - SCORPIO 160GB 5400RPM SATA-300 32MB BUFFER 7PIN 2.5INCH HARD DISK DRIVE. WD1600BUDT IN STOCK. SHIP SAME DAY. Hitachi - HTE723216L9A300 HTE723216L9A300 Hitachi Travelstar 160GB 7.2K RPM 16MB Buffer 2.5inch SATA 300 Notebook Hard Drive. New Bulk Pack. Hitachi - HTS725016A9A364 HITACHI - TRAVELSTAR 160GB 7200 RPM 16MB BUFFER SATA-2 7-PIN 2.5INCH NOTEBOOK HARD DISK DRIVE (HTS725016A9A364). IN STOCK. SAME DAY SHIPPING. Hitachi - HTS723216L9A360 HITACHI - 160GB 7200RPM 16MB BUFFER SATA-II 7-PIN 2.5INCH NOTEBOOK HARD DISK DRIVE (HTS723216L9A360). IN STOCK. SAME DAY SHIPPING. Toshiba - MK1676GSX TOSHIBA - 160GB 5400RPM 8MB BUFFER SATA-II 2.5INCH HARD DISK DRIVE (MK1676GSX). NEW WITH FULL MFG WARRANTY. IN STOCK. Western Digital - WD1600BEVS WESTERN DIGITAL - SCORPIO BLUE 160GB 5400RPM SATA 7PIN 8MB BUFFER 2.5INCH LOW PROFLIE (1.0inch) HARD DISK DRIVE. WD1600BEVS IN STOCK.SHIP SAME DAY. Toshiba - MK1676GSX MK1676GSX Toshiba 160GB 5.4K RPM 8MB Buffer SATA-II 2.5Inch Hard Disk Drive. New Bulk Pack. New Retail Factory Sealed With Full Manufacturer Warranty. Hitachi - 0A72331 HITACHI - TRAVELSTAR 160GB 7200 RPM 16MB BUFFER SATA-2 7-PIN 2.5INCH NOTEBOOK HARD DISK DRIVE (0A72331). IN STOCK. SAME DAY SHIPPING. 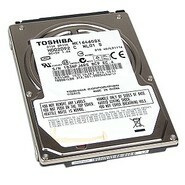 Toshiba - MK1665GSX TOSHIBA - 160GB 5400RPM 8MB BUFFER SATA-II 2.5INCH HARD DISK DRIVE (MK1665GSX). NEW WITH FULL MFG WARRANTY. IN STOCK. SHIP SAME DAY. Toshiba - HDD2J96 TOSHIBA - 160GB 5400RPM 8MB BUFFER SATA-II 2.5INCH HARD DISK DRIVE (HDD2J96). NEW WITH FULL MFG WARRANTY. IN STOCK. SHIP SAME DAY. 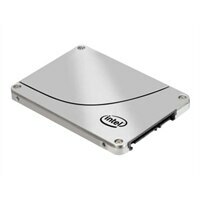 Dell - N3564 DELL - 160GB 5400 RPM SATA-I 8MB BUFFER 2.5inch NOTEBOOK HARD DISK DRIVE (N3564). IN STOCK.SHIP SAME DAY. Toshiba - MK1661GSYN TOSHIBA - 160GB 7200RPM 16MB BUFFER SATA-II 2.5INCH HARD DISK DRIVE (MK1661GSYN). NEW WITH FULL MFG WARRANTY. IN STOCK. SHIP SAME DAY. Toshiba - HDD2F25 TOSHIBA - 160GB 7200RPM 16MB BUFFER SATA-II 2.5INCH HARD DISK DRIVE (HDD2F25). NEW WITH FULL MFG WARRANTY. IN STOCK. SHIP SAME DAY. 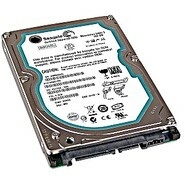 Dell - 0N3564 DELL - 160GB 5400 RPM SATA-I 8MB BUFFER 2.5inch NOTEBOOK HARD DISK DRIVE (0N3564). IN STOCK.SHIP SAME DAY. 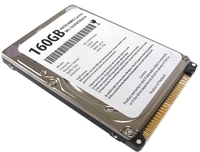 Toshiba - MK1655GSX MK1655GSX Toshiba 160GB 5.4K RPM 8MB Buffer SATA-II 7Pin 2.5Inches Mobile Hard Disk Drive. New Retail Factory Sealed With Full Manufacturer Warranty. Fujitsu - MHW2160BH MHW2160BH Fujitsu 160GB 5.4K RPM 8MB Buffer 2.5Inches Form Factor SATA 150 Notebook Hard Drive. New Bulk Pack. Toshiba - HDD2H85 TOSHIBA - 160GB 5400RPM 8MB BUFFER 2.5INCH SATA-II HARD DISK DRIVE (HDD2H85). NEW WITH FULL MFG WARRANTY. IN STOCK. SHIP SAME DAY. Western Digital - WD1600BPVT WESTERN DIGITAL - SCORPIO BLUE 160GB 5400RPM SATA-300(SATA-II) 8MB BUFFER 2.5INCH HARD DISK DRIVE. WD1600BPVT IN STOCK.SHIP SAME DAY. Western Digital - WD1600BEKT WESTERN DIGITAL - SCORPIO BLACK 160GB 7200RPM SATA-II 7PIN 16MB BUFFER 2.5INCH NOTEBOOK DRIVE. WD1600BEKT IN STOCK. SHIP SAME DAY. Western Digital - WD1600BJKT WESTERN DIGITAL - SCORPIO BLACK 160GB 7200RPM SATA-II 16MB BUFFER 2.5INCH INTERNAL NOTEBOOK DRIVE (WD1600BJKT). IN STOCK.SHIP SAME DAY. Hewlett Packard - 530888-B21 530888-B21 HP 160GB 7.2K RPM Hot Swap 3G Form Factor 2.5inches Midline SATA Hard Drive in Tray. New Bulk Pack. Hewlett Packard - 530932-001 530932-001 HP 160GB 7.2K RPM 2.5Inches SFF Hot Swap Midline SATA-II Hard Disk Drive In Tray For Proliant. New Bulk Pack. Hewlett Packard - 507749-002 507749-002 HP 160GB 7.2K RPM 2.5inches SFF SATA-II Hard Disk Drive With Tray. New Bulk Pack. 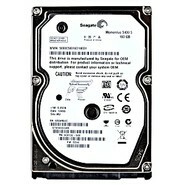 SEAGATE - HARD DRIVE - ST9160821A SEAGATE - MOMEMTUS 160GB 5400 RPM PATA LAPTOP HARD DISK DRIVE. 8MB BUFFER DMA/ATA-100 9.5 MM HEIGHT 2.5 INCH (ST9160821A). IN STOCK.SHIP SAME DAY. Hewlett Packard - 530932-001 HP/COMPAQ - 160GB 7200RPM 2.5INCH SFF HOT SWAPABLE MIDLINE SATA-II HARD DISK DRIVE WITH TRAY FOR PROLIANT SERVER BLADES DL SERVERS AND ML SERVERS SERIES (530932-001).IN STOCK. SHIPS SAME DAY. Hewlett Packard - 530888-B21 HP/COMPAQ - 160GB 7200RPM 2.5INCH SFF HOT SWAPABLE MIDLINE SATA-II HARD DISK DRIVE WITH TRAY FOR PROLIANT SERVER BLADES DL SERVERS AND ML SERVERS SERIES.(530888-B21). IN STOCK. SHIPS SAME DAY. 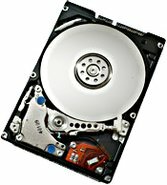 Dell - 464-0692 DELL - 160GB 7200RPM SATA-II 2.5INCH LOW PROFILE (1.0INCH) HARD DISK DRIVE WITH TRAY (464-0692) IN STOCK. SHIP SAME DAY. IBM - 42D0747 IBM - 160GB 7200RPM SATA 2.5IN SFF SLIM-HS HARD DRIVE (42D0747). NEW FACTORY SEALED. IN STOCK. SHIP SAME DAY. 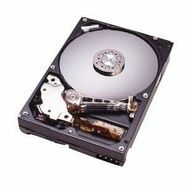 Dell - 341-7443 DELL - 160GB 7200RPM SATA-II 2.5INCH LOW PROFILE (1.0INCH) HARD DISK DRIVE WITH TRAY (341-7443) IN STOCK. SHIP SAME DAY. 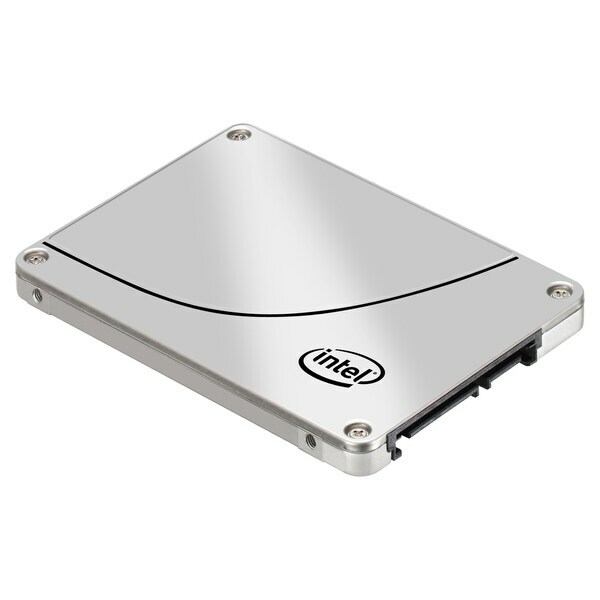 Dell - P975H DELL - 160GB 7200RPM SATA-II 2.5INCH LOW PROFILE (1.0INCH) HARD DISK DRIVE WITH TRAY (P975H) IN STOCK. SHIP SAME DAY. Dell - M596H DELL - 160GB 5400RPM SATA-II 8MB BUFFER 2.5INCH HARD DISK DRIVE(M596H)FOR SELECTED DELL SYSTEM. IN STOCK. SHIP SAME DAY. Dell - 341-9332 DELL - 160GB 5400RPM SATA-II 8MB BUFFER 2.5INCH HARD DISK DRIVE(341-9332)FOR SELECTED DELL SYSTEM. IN STOCK. SHIP SAME DAY. 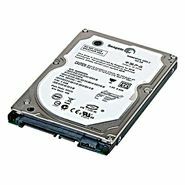 Toshiba - MK1661GSYB MK1661GSYB Toshiba 160GB 7.2K RPM 2.5-inch 16MB Cache SATA with ROHS Compliant and HIGH Durability Hard Drive. New Retail Factory Sealed With Full Manufacturer Warranty.